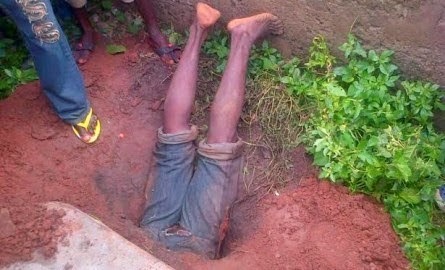 Residents of Ilobu town, Irepodun local government area of Osun state were thrown into confusion in the early hours of Wednesday, when a dead man was discovered in an open grave with a shovel beside him. 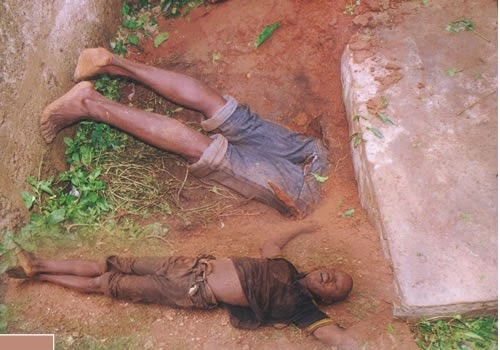 According to residents, the man who was described to be middle aged may have been attempting to exhume a corpse for ritual purposes from the grave he was discovered stone dead. The suspect’s accomplices fled in terror after seeing half his body gets stuck mysteriously in the grave. His death has generated concern among the terrified residents of the Ilobu community. Saturday Tribune gathered that the victim and his partners in crime allegedly came to Tonto compound in the early hours of Wednesday with a plot to exhume the corpse of an aged woman and sever her decomposed head, allegedly for ritual purposes. He explained: “There are indications that he did not dig the grave alone. What we discovered is that he may have been attempting to cut off the head of the corpse when something suddenly hooked him as he managed to force half of his body into the grave to cut off the head. 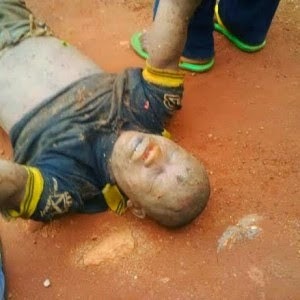 While commenting on how the residents of Ilobu got to know about the incident, since it happened in the wee hours, the source said a woman who was hawking ogi (a local corn meal) early in the morning of Wednesday spotted the torso of the suspect sticking out of the grave and raised the alarm. “His corpse was discovered around 6.30am and his head was covered in mud. The residents here alerted the police division in Ilobu and they later came to evacuate the body and put it in their van before taking him away,” he said. Saturday Tribune was informed that the remains of the suspected ritualist were subsequently taken to and deposited at the mortuary of the Ladoke Akintola University Teaching Hospital (LAUTECH), Osogbo, the state capital. When contacted, the Commissioner of Police in Osun State, Mr Ibrahim Maishanu, said he was aware of the incident, and that the police would conduct investigation to determine what led to the suspect’s death. He said the police could not confirm that the suspect was a ritualist because of the circumstances surrounding the discovery of his corpse at a grave in Ilobu; that they would have to investigate the matter before giving any concrete information on the incident. A few weeks ago, no fewer than four suspected kidnappers were burnt to death in Osogbo and Ikire after they were accused of kidnapping. Worried by the development, Maishanu, on Tuesday after the state security council meeting in the Government House, said “the act of (meting out) jungle justice to suspects is barbaric, uncivilised and unacceptable. The security agencies will not fold their arms and watch our society descend into anarchy.